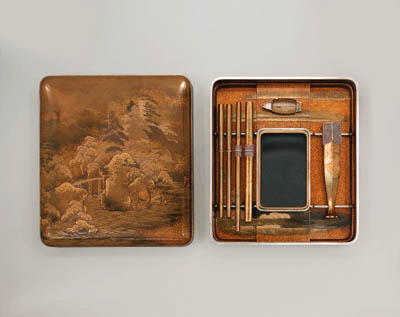 From about 1880 onwards, foreign demand for mementoes of famous tourist spots in Japan inspired a new style of lacquer in which easily identifiable sights are depicted in full rather than being subtly implied as in earlier lacquer. Favourite subjects include the Toshogu Shrine at Nikko, the Shichirigahama [Seven-League Beach] and the peninsula of Enoshima and, as on the interior of this box, the now world-famous Itsukushima Shrine at Miyajima in Hiroshima Bay, celebrated for its torii [archway] standing in the sea. Dedicated to three daughters of Susano-o, the Impetuous Male Deity, it was restored in the 12th century by the great warrior Taira no Kiyomori. "The torii in front of it, which stands in the sea, is a favourite motive of Japanese art; and the temple itself, being partly built over the sea on piles, appears to float at high tide upon the surface of the water...A characteristic feature of the temple is its gallery, 648ft. long, hung with ex-votos. Many of these are old pictures by famous artists; but even so sacred a shrine as Miyajima has not altogether escaped modernisation, as is attested, inter alia, by hideous daubs in oil of the China War..." [see 1 below]. The Khalili collection includes a lacquer box with a similar view; it is also seen in Kyoto Satsuma wares [see 2 below]. 2 Impey, Oliver and Fairley, Malcolm [eds. ], The Nasser D. Khalili Collection of Japanese Art, (London, 1995), vol. 4, pt. 2, cat. no. 221; vol. 5, pt. 2, cat. no. 166, no. 130.